On St. Paddy’s Day I am reminded of the joys and pleasures that come from a simple pot of corned beef. For me, one of the best benefits is the corned beef hash that follows the big blow out. If you happened to read the previous post then you know it all changed this year. Because of that, I suddenly had a glorious portion of corned beef already cooked and ready to go before St. Paddy’s Day— If I so wished. It was indeed an awesome awareness when I awoke this St. Paddy’s Day realizing I could have my favorite corned beef hash for breakfast! In the past it would have taken another day before I pulled out the food processor or meat grinder to process the leavings of the previously cooked corned beef, cabbage, and boiled vegetables into a lux hash. On this morning, I keep the hash at its essence: mere sweet onion and corned beef, and into the pan it goes. I break up a bit of the moist corned beef, but for the most part that’s not necessary. It forms its own hash. Joy upon joy, on this St. Paddy’s morning as Irish music lifts the air, breakfast breaks forth with sweet, succulent hash—miraculously transformed from a simple corned beef. Set a skillet (with a lid) over a medium setting, add the butter and heat until bubbly. Add the onion and sauté to softened, 2 – 3 minutes. Add the corned beef and gently combine with onion; sauté to heat the corned beef and the onion browns around edges. 3 – 5 minutes. In the pan, form the hash into 2 serving portions, make a slight well in their centers and crack an egg into each. Drizzle @ 1 tablespoon water around edges to create steam, and cover with lid. Cook 3 to 5 minutes until the eggs are set and cooked to personal preference. St Patrick’s Day is one of my favorite days of the year—it’s right up there with another food day, Thanksgiving. Mid-March, my east coast roots tend to surface and the need for corned beef rages! Of course, it wouldn’t be worth getting out of bed if I wasn’t secure in the knowledge that corned beef and cabbage were planned for later in the day. Over the years, I’ve gotten in the habit of making more than necessary so there will be leftovers. 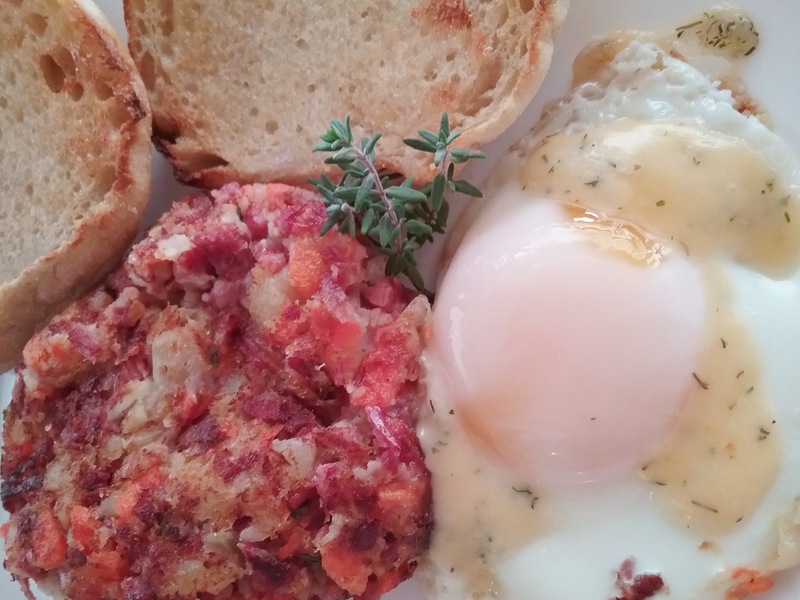 One of the spoils of the day is the assurance that corned beef hash is also right around the corner. Hash hardly requires a recipe. I used to grind the corned beef and vegetables in a meat grinder; later the grinder was replaced with the food processor. Now, I simply mince up the cooked beef, chop up some of the boiled potatoes, carrots, onions—and perhaps toss in a bit of cabbage. Then, I give it a good mash to bind it all together, and drop it into a skillet, either in one mass or in separate patties, and cook until hot and crispy. Add an egg or two and it’s a beautiful thing. 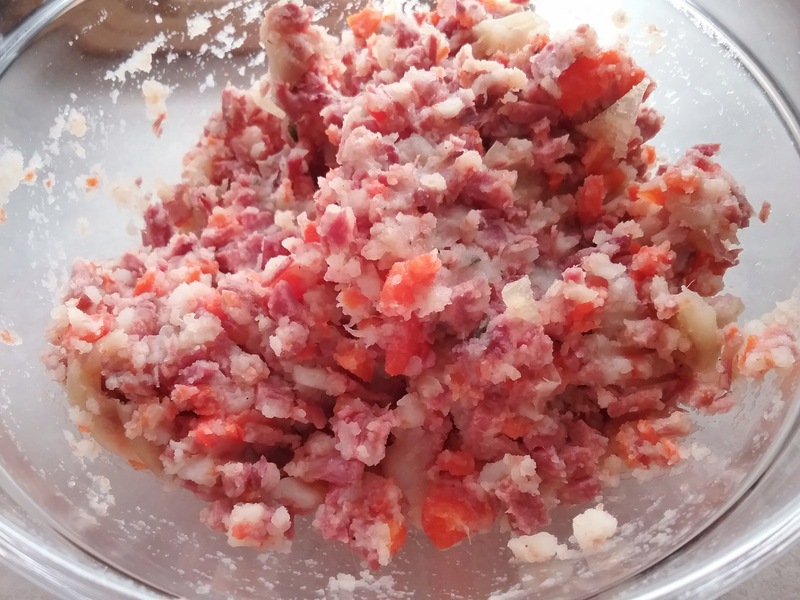 Place the corned beef and vegetables in a mixing bowl and gently mash to form cohesive mass. There should still be plenty of texture. Heat 10-12” skillet over medium heat and form the hash into patties. Place in the pan and heat until crisp on bottom, about 5-7 minute. Turn and repeat on second side. Serve with eggs of choice. Yield: 4-6 servings.